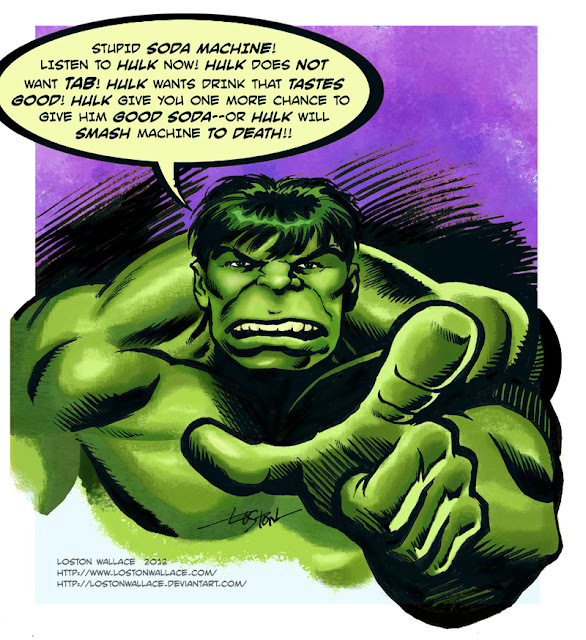 Giant-Size Marvel: Marvel Funnies: Hulk Hates Diet Soda! Marvel Funnies: Hulk Hates Diet Soda! Lots of articles around about the "soda tax" many states and cities want to impose. Seems really silly to me and a slippery slope to taxing more things that are bad for us. This illustration featuring The Hulk reminded me of this in a roundabout way, courtesy of Loston Wallace, doing his best to channel the style of Herb Trimpe. I featured Loston's work earlier this year on The Thing. Please check out Loston's DeviantART site for more of his work. Do you remember the days when Diet Coke didn't exist but Tab was the "healthy" alternative drink? I don't think I've seen a can of Tab around in decades. Nuff Said!